Patent applications are always interesting fodder for speculation - even if they never turn out as real products, they give a window into the thinking and prototyping going on inside the major companies. 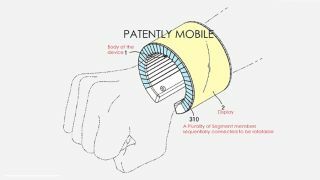 With that in mind we present to you Samsung's latest idea for a wearable: an OLED bracelet that can wrap around your wrist as well as roll out flat and function as a smartphone. The screen is made up of individual segments that give the device its flexibility. Everything from incoming calls to weather reports could be displayed on your wrist, though the hardware looks a little too bulky to be worn on a regular basis. We'd hope the final version of the kit is a lot slimmer than the diagrams included with the patent application would suggest. Patently Mobile says the device could support both multimedia and communication modules, so you could play your music and call home on the same gadget. There are also hints of a rotating display that would move with your arm. Touch input would be supported and it looks like there would be a transparent protection panel on top to guard against knocks and scratches. The rest of the patent doesn't go into too much detail about the gadget or how it would be used, so it would seem to still be at the early stages. Of course, this being a patent application, we don't know if or when Samsung's super phone bracelet is going to see the light of day. Apple has filed patents along similar lines though, so the next generation of smartwatches may in fact be fully fledged flexible smartphones.